RPR KERATIN SMOOTH & GLOSS system straightens, smooths and glosses hair. This professional 2 step salon service works in synergy with the hair to create silky, smooth, straighter hair. It is created with natural extracts of Amazonian Babacu Fruit and Keratin for optimum hair hydration, health and shine. 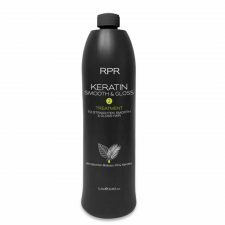 The treatment has a liquid base, so it penetrates deeper into the hair fibre releasing more curl in a quicker time process and at a greater level for longer lasting results. It offers outstanding results on course, frizzy, blonde or coloured hair. FORMALDEHYDE FREE. MADE IN BRAZIL. LONG LASTING RESULTS.